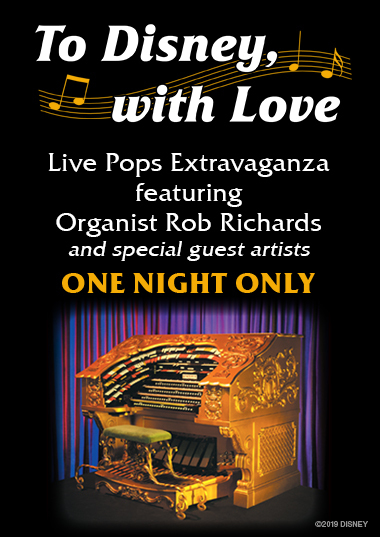 One Night Only: Enjoy a live Pops concert performance featuring our world famous Mighty Wurlitzer organ, internationally recognized concert and recording artist, organist Rob Richards plus special guest artists Nashville pianist Alex Zsolt and singer Bonnie Gordon! This two hour concert of Disney favorites will have a brief intermission midway through the performance. Join us as we celebrate the magic of Disney Music and Rob Richards’ 20th El Capitan Anniversary! Through music, follow Rob’s journey from a childhood Disney fan to fulfilling a true Hollywood dream as Tinseltown’s iconic organist! Guests will be delighted by Disney classics & concert favorites played on the Mighty Wurlitzer Organ, plus, guest artists Nashville pianist Alex Zsolt and singer Bonnie Gordon! PLUS, making its return to the big screen - Walt Disney Animation Studios’ “Get a Horse” starring Mickey Mouse and accompanied by the Mighty Wurlitzer Organ!